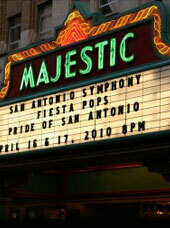 The Majestic Theater is San Antonio's oldest and largest atmospheric theatre. Located in the heart of downtown San Antonio, the Majestic was designed and built in 1929 by John Eberson. In 1975, the theatre was listed on the National Register of Historical Places & was designated a National Historic Landmark in 1993. In 1996 a 3.5 million dollar expansion of the stage house was completed allowing the Majestic Theater to continue to house Broadway mega-musicals, performing arts events and concerts.